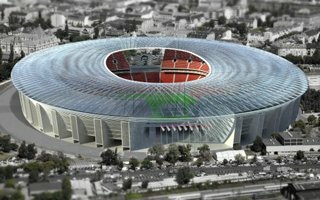 Renowned tire manufacturer Continental acquired 5-year naming rights for the new stadium under construction in Regensburg. Local club Jahn won’t benefit from the deal, though. It’s cheaper, greener and more modern. 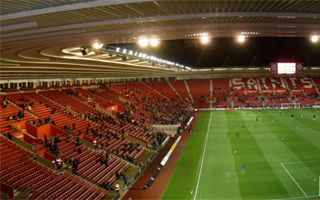 Southampton are England’s first club to change stadium floodlights to LED lighting system. Will this be the new standard? 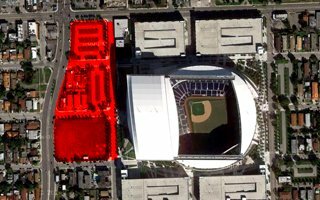 Possibly, according to The Construction Index. 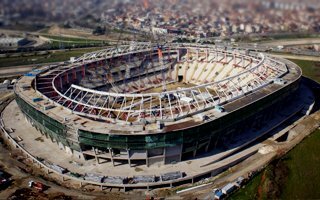 One of the largest stadiums under construction in Turkey gains pace after months of standstill. 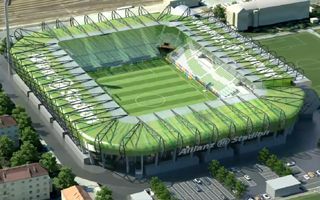 Future home of Bursaspor sees the cable roof slowly rise above ground. 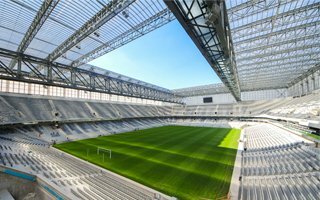 Great news for traditional fans came from the Polish legislature today. 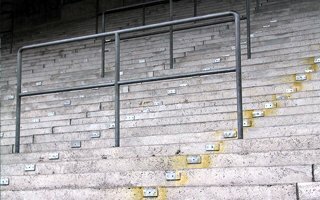 Amendment to the Mass Event Safety Act is expected to allow standing sections back inside stadiums already this summer! 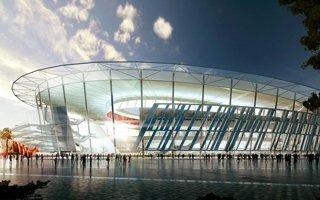 The scheme worth AU$250 million is a step from design and contractor selection. 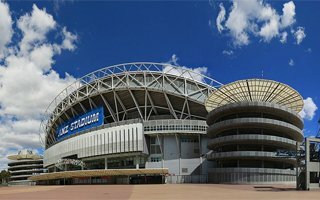 Stadium Australia Operations are expected to view detailed proposals within days and publish them this summer. 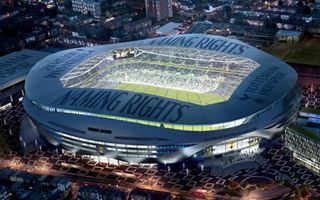 It’s been over 90 weeks since the notion to grant compulsory purchase order for one business standing in the way of new stadium. Usually decisions like these are handled within 10-11 weeks. 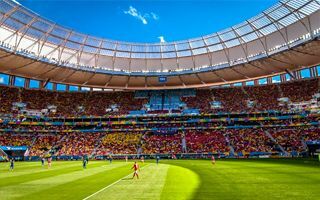 Very often stadiums have visibly inspirations or associations with local themes. 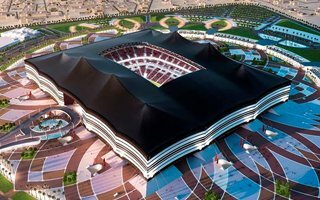 This isn’t the case, the new Al Khor Stadium in Qatar is very literally a Bedouin tent, far from loose inspiration. Bad news: preparatory works won’t start in 2014. 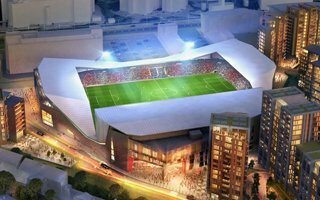 Good news: Brentford FC are still the first club since Arsenal to build a new stadium in London. 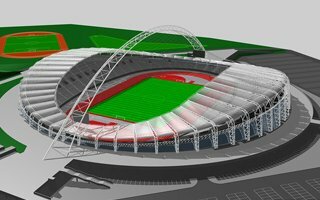 20.06.2014 New design: Lithuania’s national stadium, but for how much? 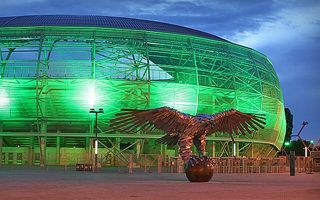 Transparency International Lithuania sounds the alarm as works are to resume on Lithuania’s ghost stadium, abandoned in 1993. 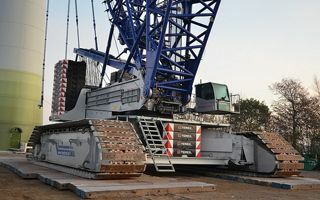 The organization claims it may cost up to €200 million, but government dismisses the claims. 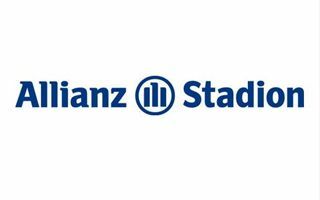 20.06.2014 London: Stamford Bridge for 55,000 people? 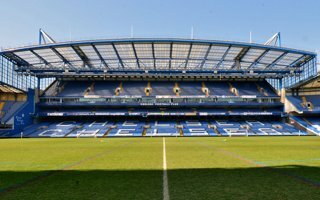 Roman Abramovich commissioned a study into potential expansion of Chelsea’s home. 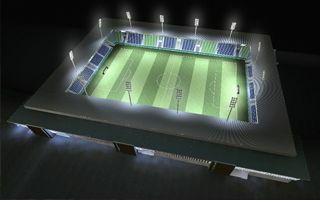 That’s interesting, especially that the club earlier tried to convince fans it’s not feasible. Just over two months – this is how long (or short?) 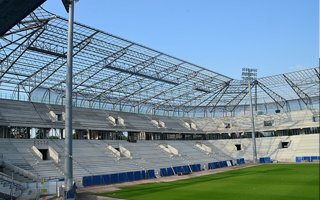 it took to deliver the primary roof structure over new 22,400-seater in Białystok. 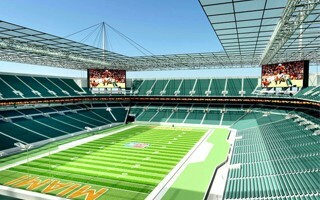 Entire stadium should be ready in mid-August. 19.06.2014 New design: Cheap, but decent remodeling? 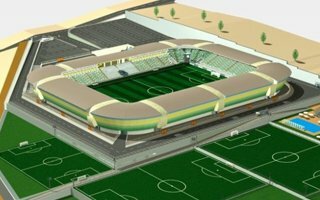 This Romanian city hasn’t got enough resources for a brand new football stadium. So why not save the old one with much, much less? These are the first effects. 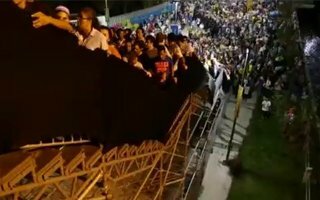 A fan-made video clip shows how temporary staircase structure sways from side to side under hundreds of people. 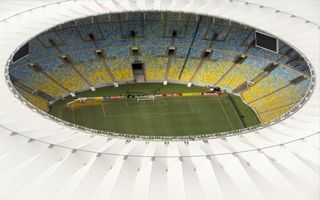 As disturbing as it is, some media outlets persistently claim the structure is at Maracana. Well, it’s not. 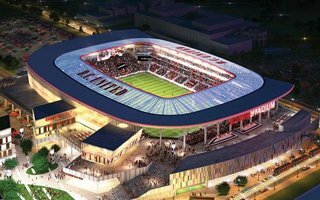 By the time this stadium is ready, it’s going to be a decade since DC United have been trying to build their own ground. 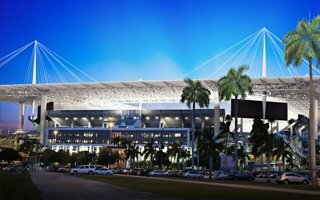 Will the latest renderings come to fruition? First answer soon, after DC Council vote. 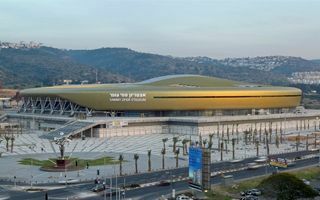 Greek architect is coming to Cyprus tomorrow to re-launch work on the new Limassol stadium. This time it’s planned for three derby rivals, not two like previously. 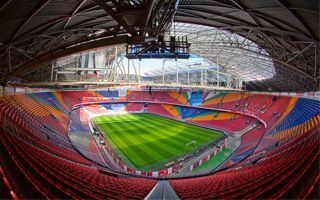 Most desired scenario: everything goes well, the game is great and matchday experience for those inside at least enjoyable. 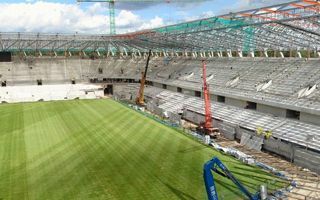 But until today evening, work is still in full swing to get the stadium ready. 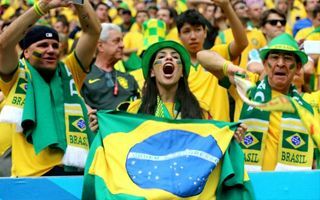 11.06.2014 World Cup comment: English hooligans? What English hooligans? If you haven’t seen them yet, it’s probably because Argentine hooligans took most of the spotlight. 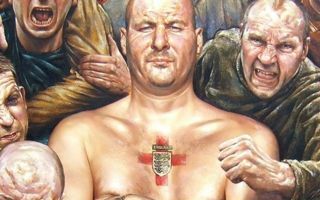 But headlines with the myth of English yobs invading the host country are well alive. Should they? 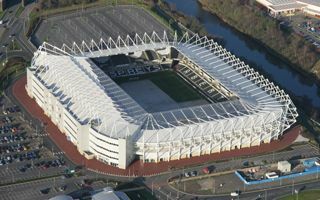 Swansea City chairman announced the upper deck of Liberty Stadium’s east stand may begin to grow in January. 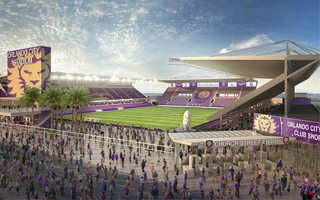 First phase will see a 4,000-5,000 capacity increase. First of the 300 houses set for demolition are already leveled at Lothair Road. 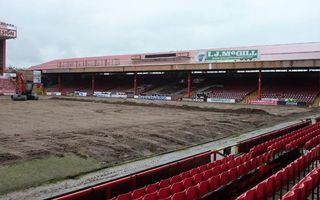 Soon the street itself will also be a memory, making way for the main stand expansion. Vice-champions of Italy confirmed today their cooperation with CAA Sports. 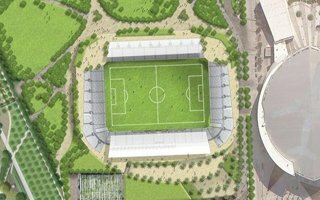 The company is expected to commercialise the new stadium, still in the planning phase. 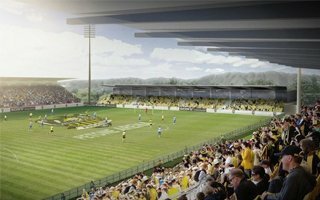 New 12,000-capacity stadium for Wellington Phoenix FC will not get support from the mayor. 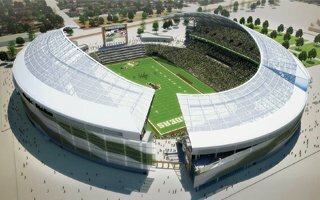 Decision was made as community stands against the project. 09.06.2014 USA: Third league club drawing 20,000 per game? 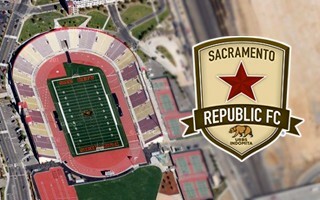 Very few clubs playing at the third level in their respective countries can match Sacramento Republic’s season so far. 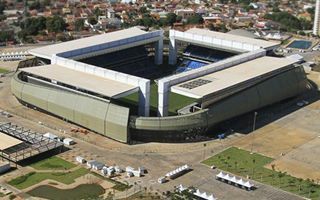 The club has an average of 19,526 people per game. 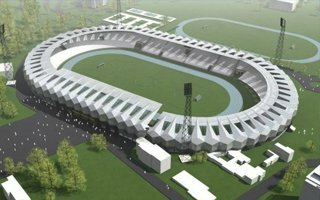 07.06.2014 Luxembourg: New national stadium in 2019? 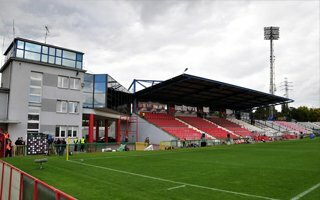 In most countries a stadium of this size wouldn’t raise much interest, but Luxembourg is among the world’s smallest states. 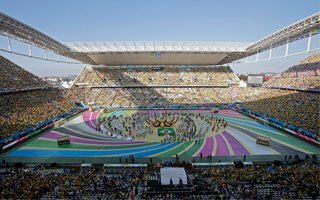 So a 9,000-capacity national stadium sounds very sensibly, both for football and concerts. 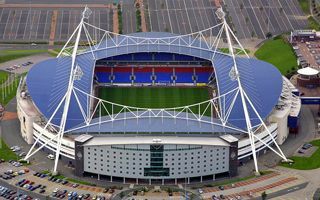 Bolton city council gave the green light to £100 million investment planned within and around Reebok Stadium. 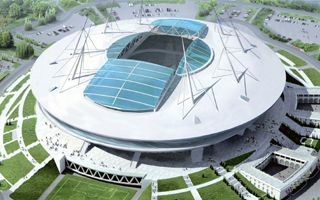 A sports college, offices, hotel and apartments will be created. Don’t worry, you don’t have to say these names out loud. 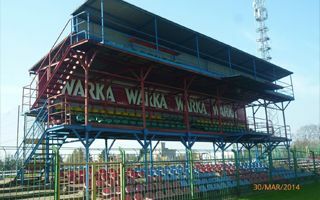 But checking out stadiums in these four Polish towns may come in handy some day! 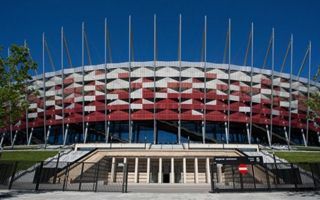 Thanks to our photo-correspondent Sebastian Spychała further Polish stadiums join StadiumDB. 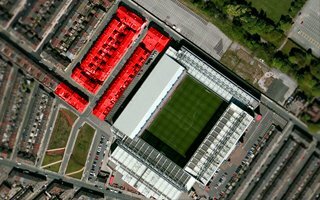 05.06.2014 Liverpool: Anfield expansion to start in early 2015? 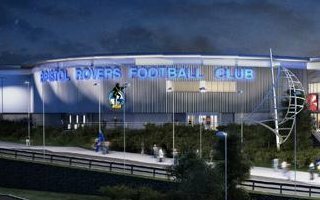 This time next year we may already be looking at workers building the new Main Stand. 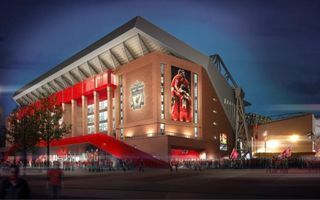 Liverpool have just filed the planning application and hope to open the 21,000-capacity stand in time for 2016/17 season. 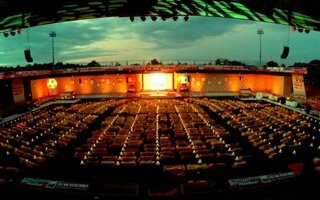 Number of events doubled, revenues increased by 121% in the first half of 2014. 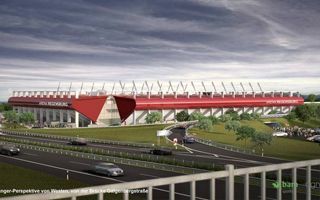 This year Stadion Narodowy is to get out of the red, in 2015 it should see a significant profit. 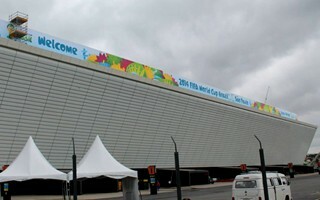 Though final touches are being added outside the stadium, it’s ready as planned. 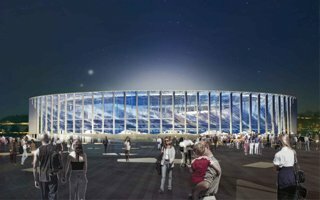 14 months was a very tight time frame, but Hungary’s largest sports project has kept it. Removing the old field and covering the ground with fresh grass was delivered in just 14 hours. Operations this fast are a rare sight, but is the quality high enough? We’ll know after today’s game. 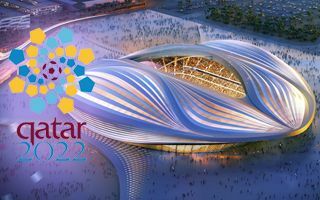 FIFA members assure that Qatar may be stripped from its hosting rights if corruption accusations are confirmed. 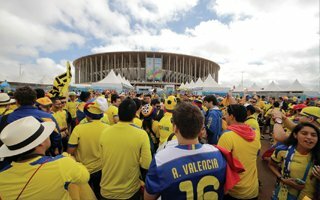 Previously lost bidders watch closely as pressure mounts over FIFA ahead of final inquiry report. 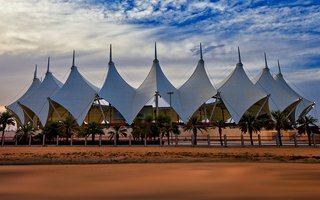 In just two weeks the stadium will host its first World Cup game. A month later it’ll witness the final. Meanwhile, intensive use over the past weeks severely challenged its field’s quality. 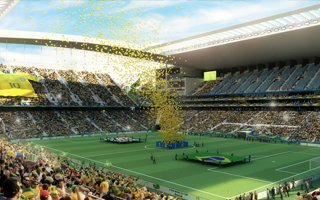 FIFA specifically ordered a further test game for Arena Corinthians to assure at least one game with all stands opened will be played. But once more only 40,000 people were allowed inside yesterday. 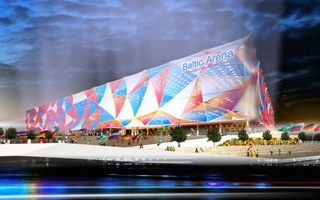 01.06.2014 Saint Petersburg: Vladimir Putin Arena? No, that’s not a joke. 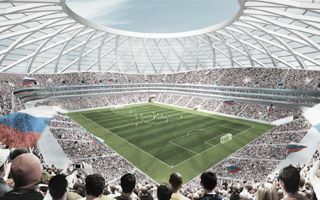 Saint Petersburg lawmaker Vitaly Milonov suggested to name Russia’s largest new stadium after Vladimir Putin, honouring the epic Russia is living right now.